This week the cover of The Winter Passing is in the Author Shout Cover Wars vote (vote here – you can vote once a day) so I thought it was as good a time as any to talk about the cover design and packaging! 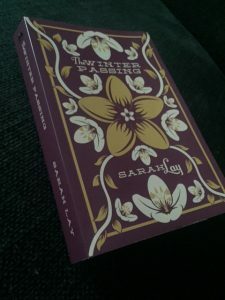 The cover was designed by Marcus Galley at Mammoth Creative Works and draws on themes from the story – both the colours and the flower can be found within the novel. We’ve worked together before on music posters but Marcus took the brief for the novel – in terms of the symbolism and style but also the touchpoints of cover design I gave him – and arrived at this perfect design pretty much straight away. For me it perfectly evokes elements of the story while also bringing to mind some classic cover design on novels I love – particularly the Brian Cronin designs for John Wyndham Penguin paperback editions – as well as vintage botanical illustration. The cover design motif are repeated throughout the paperback edition of the book on fly sheets and chapter headings through the type design work Biddles Books did on the novel. The interior font is Baskerville – one of the most popular fonts in literary fiction but also highly readable while also elegant. But the design of The Winter Passing didn’t stop there – I spent a lot of time thinking about how I wanted people who bought the book to feel when they opened their package in the post. I wanted the experience of The Winter Passing to begin before they had even got to the first page and to stimulate a number of senses beyond how it looked, particularly touch and smell. This meant carrying more of the symbolism through and evoking the style of the Morrigan, giving you a little hint of how Centaury experiences in great detail the world around her, feeling as much as seeing what is around her. From the colours used – emerald green, purple and gold – to the bouquet of items on the front cover there is a link back to the story and to the characters you are about to meet. WARNING: SPOILERS AHEAD – so you may wish to come back to this post after you’ve read the book (order your paperback copy here). The paperback packaging starts with emerald green tissue paper – with the colour green repeatedly appearing throughout the story. It refers to the green of the island and the vast array of shades between moorland, woodland, moss covered stone and the grasses of the sand dunes but also represents the colour of the Morrigan power when it is healing. The Morrigan seal keeps it all together along with a handwritten card featuring The Winter Passing design in purple and gold. 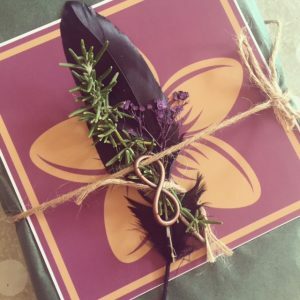 These too are colours present throughout the book – the Morrigan power is golden when working for good, when at its most potent, while purple (which symbolises a calming of the mind and a positive awakening) is also the colour Centaury associates to Rune. The crows are part of the island too – their magic powerful in its own right as well as being aligned to the Morrigan. They are the keepers of memory and in this case the feather represents new experience and letting go of past beliefs. Some of the books come with a genuine crow feather collected from the ground in the woodland around my home, while others have a representative feather – the birds don’t shed on demand so it’s a bit lucky dip what you get! Take the meaning if not the authenticity. I’ll write a whole post on the deeper meaning of crows, and The Crows in The Winter Passing. A favourite creature of mine for their intelligence, symbolism and beauty a pair of crows can also be found on the cover in the Reckless Yes Publishing logo. Another intrinsic part of Centaury’s identity – she is named for a wildflower, many of her memories and experiences of place involve flowers, and the song Rune often sings to her is of wildflowers too. I am a big fan of the language of flowers as well as the properties of plants in healing as well as magic so to include some in the bouquet was really a given. Most copies come with pressed gypsophila – also known as baby’s breath or soap wort – which has the meaning of fertility, being pure of heart and innocence. This too is representative of Centaury and her story. The Morrigan power is a sort of fertility in itself and with the return of her memories her innocence is lifted and she starts to see people and the world through different eyes. As well as pressed flowers copies shipping within the UK also include a sprig of rosemary in the packaging. Cut fresh from my garden as I package the order the inclusion stimulates the sense of smell as the book is handled for the first time but also has a deeper meaning related to the story. For rosemary as a herb represents rememberence, love, memory and mouring all of which pretty much sum up the core themes of The Winter Passing. Finishing off the packaging is this little charm, held in place by twine. Also known as the symbol for infinity the eternity knot is seen throughout The Winter Passing and is the symbol of Centaury and Rune. He has the symbol tattooed on him and when they become bound to each other it is this knot which appears through them in the joining of their hands. This one is a nice little copper charm which has even more meaning behind it – protection from negative energies, a little self-esteem boost, physical and emotional alignment, as well as connecting you to your true emotions and even enhancing your psychic abilities. Hopefully those who have ordered the paperback version of the novel have enjoyed the packaging as a start to their reading experience and even without knowing it have been thrown into a world where there is meaning in everything beyond what the eye can see or you remember of an item, place, person, or time. You can vote in Author Shout Cover Wars here. 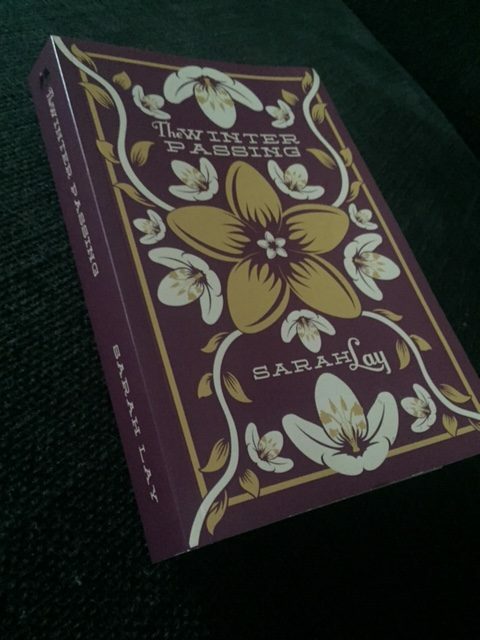 buy The Winter Passing limited first edition paperback book.